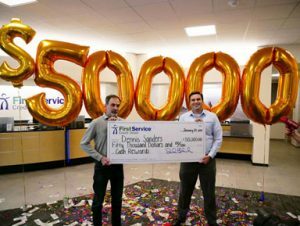 HOUSTON, January 24, 2019 – One lucky member of First Service Credit Union was handed a check for $50,000 after winning the grand prize in the credit union’s 2018 Cash Rewards Sweepstakes. The lucky winner, Dennis Sanders of Lake Jackson has been a member of First Service since 2005. Sanders has remained a First Service member over the years because of how easy the credit union is to work with. “Anytime that I’ve needed anything, First Service made it extremely easy to accommodate me,” said Sanders. Beginning in mid-2018, one First Service member was awarded $1,500 each week, with a final drawing for a $50,000 grand prize. To participate in the contest, members earned entries by completing transactions such as having a direct deposit, making mobile deposits and making debit or credit card purchases. Members also earned entries for volunteering in their communities and logged 1,495 volunteer hours through the Cash Rewards program. In 2018, more than 48,000 members participated in the sweepstakes and 26 winners won a total of $39,000. The winners have used their money to go on dream vacations, fund equipment that will help them further their passions, help pay for their child’s education, recoup the cost of unexpected expenses, pay for a move, and give Christmas money to family in need. First Service Credit Union is a not-for-profit financial institution that provides financial services that enhance its members’ lives. It has ten full-service branches in the Houston metropolitan area. It was founded in 1977 by employees of a premier engineering, procurement, construction and services company and is now community chartered to serve anyone in the Houston area. For more information, visit FSCU.com.